What’s the best way to stiffen a plywood subfloor? And, what are some of the best configurations to use to accomplish that goal? 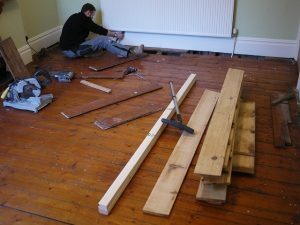 Here, we discuss a few methods for stiffening up a wood floor, whether it’s an older one built before plywood came into use or if it’s an existing plywood subfloor. So grab your tools, and let’s get started. Did you know that every time you put a load on your floor, even if you’re just walking across it, at least two components will flex by bending or deflecting? One of those things is the wood between the joists, and the other is the joists themselves. Both factor in to contribute to the bounce or sense of movement you are experiencing, and both come together to create annoying squeaks that will only get worse over time. In order to fix the problem, you have to address both of the areas that are bending. This doesn’t necessarily mean that you have to do two separate fixes, just that you need to be sure that you add support that will reinforce both parts of the problem area. Use one or more of the following configurations to add new life to your floor, and consider building a supporting wall in your basement, too. It doesn’t have to be in the center, it can be a few feet from the foundation wall and will add closet space. Further from the foundation, this supporting wall can be the beginning of a new bathroom, utility room, or other useful space in your basement. Sturdy metal bridging, also known as X-bracing, enables floor joists to share weight so force from above is transferred from one joist to its neighbors. This solution is a good one in cases where you have access to the floor joists from below. Note that this is an easy, inexpensive fix, but keep in mind that it works best when used in concert with another of the methods discussed here. If your upstairs floors are finished and you don’t want to take them up, consider adding plywood to the undersides of your joists after completing the following steps. 1. Check your joists to see if they are centered 16 or 24 inches apart, so you’ll be able to purchase the proper metal bridging size. 2. The next thing you’ll want to check is the number of joist spans (areas between joists). You will need two sets metal bridging for each span if the center of the spans already have bridging. If the centers of the spans are not already bridged, you’ll need three sets of metal bridging per joist span. Double-check your math to be sure you get the count correct, so you don’t have to go to the hardware store twice. 3. Both metal bridging sizes are hung with 1-3/8 inch joist hanger nails, and each one requires four of those nails (two at each end). Be sure you purchase enough nails for the job. 4. Start by checking the original bridging. Add nails and/or screws to secure any loose spots. 5. Add a new row of bridging along both one-third points of the span. If your joists span 9 feet, for example, place the bridging three and six feet from the foundation wall. If the center of the span has no bridging, add a row there, as well. This configuration is also one that requires you to have access to the undersides of your floor joists. It is a fantastic way to stiffen a plywood subfloor, and it adds life to older subfloors made of individual boards as well. If you’re working in an unfinished basement that you plan to finish at some point, be sure to take electricity into consideration. You may want to plan for overhead light fixtures, fans, etc. to be installed at a later date. Finally, note that this job involves some heavy lifting. You’ll need a strong helper. 1. Measure the area you plan to reinforce so that you know how much plywood to purchase. Each 8-foot sheet of plywood will be centered on the span, leaving the ends of the joists exposed. You can add more sheets of plywood to the ends of the joists if you want to – it will cost a bit more but will give your space a nice, finished look. 2. 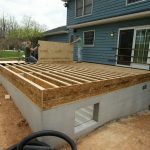 You’ll get the most from your investment by creating a rock-solid bond between the undersides of the joists and the new plywood you are installing. To create this bond, you’re going to need to apply a construction adhesive recommended for subfloors, along with plenty of drywall screws at intervals no greater than four inches. To determine how many drywall screws to purchase, measure the length of one of the joists and divide it by four inches. Just use 8 feet if you plan to install a single row of plywood sheets across the center of the span. The resulting number will tell you how many screws you’ll need for each joist (24, if covering only the center span). Double the number of screws for joists where two edges of plywood will meet (48, if covering only the center span). Add the numbers for each joist together to come up with your total. 3. Use 60- to 80-grit sandpaper to rough up the underside of each joist. 4. Apply adhesive just before putting each piece of plywood into place. 5. Screw the plywood to the joists at intervals of four inches or less, ensuring it runs parallel to them, not across them. If you don’t have access to the underside of your floor joists, you can easily stiffen a plank or plywood subfloor by installing an additional plywood underlayment. Yes, taking up carpeting, linoleum, or tile can be labor-intensive, but the tradeoff is a much stronger floor that ultimately adds longevity and value to your home. Choose quality plywood for the job, noting that even ¼” birch will add plenty of stiffness to an existing floor without raising the level too much. If floor height isn’t an issue, 1/2 to 5/8 inch plywood will create an even sturdier bond. 1. Clear the room of furnishings. 2. Remove the flooring using the appropriate tools for the job. 3. Inspect the subfloor. If it’s an old board subfloor or if the existing plywood is damaged in any way, it probably is not doing much for you. Consider removing the old subfloor, either before moving forward or bit by bit as you install a new tongue and groove plywood subfloor and an additional plywood underlayment. 4. If the existing plywood subfloor isn’t screwed to the joists, you can add stiffness by screwing it down with deck screws. Note the position of the joists and use a straight edge to draw a line from one end to the other so you’ll be able to work more quickly. 5. Rough up the subfloor with 60- to 80- grit sandpaper. 6. Apply construction adhesive between all the joints of the existing subfloor. This will help eliminate existing squeaks. 7. Apply construction adhesive to the subfloor as you apply each piece of new plywood. Lay the new pieces perpendicular to the old ones. Fasten them with deck screws at regular intervals, not just along the joists, but between the joists. Remember, you want to create a rock-solid bond between your layers of subflooring. Conclusion: Using at least two of the above methods will stiffen a plywood subfloor very well, and using all three will add even greater rigidity, helping your entire home stand the test of time.